You pay a fee to set up an account and also when you deposit additional funds. You also may pay processing or transaction fees. But considering how much interest you'd pay with a regular credit card if you carry a balance, you may make out much better with prepaid cards despite their fees. Your card balance is never more than you can afford. Money must be deposited into the account before you can actually make purchases. Prepaid cards usually look like regular credit cards, so when you use it, the only person who knows it's a prepaid card is you. You can use prepaid cards in many establishments, and they can be helpful when making travel reservations or renting a car. Some businesses may not accept prepaid cards. For example, some Internet retailers may not accept them to avoid the risk of not getting paid if you don't have money in your account. Also, if you need to use a credit card for a gym membership or other recurring dues, you may not be able to use a prepaid card. Prepaid cards may be convenient when traveling. 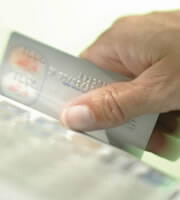 Credit card use abroad can often result in high fees for each transaction. Using a prepaid card can help you avoid those fees and stick to a budget. Using prepaid cards can help you avoid credit card debt. You only spend money that you have, so prepaid cards are like a forced savings plan. Prepaid cards give lower-income people without bank accounts more spending power. Prepaid cards are reloadable. Handling your prepaid account wisely could help repair a damaged credit history, although it won't likely affect your credit score since you're not being offered a line of credit. Some prepaid cards allow you to set daily, weekly, or monthly spending limits. It's important to read through all the prepaid card terms before activating an account. For example, look for whether there is an expiration date for using the funds on the card. But if you want to get rid of debt and go cold turkey on using traditional credit cards, a prepaid card is one tool that can help you achieve that goal. 0 Responses to "10 Things to Know About Prepaid Cards"